Hi, this is a topic to keep you up to date about the status of the English texts, changes we'll still have to make and where you can ask about individual texts. Edit: removed a list of files with pending proofreading. The latest English texts have been uploaded to GitHub. And here's all the new strings, they're always at the end of each file. Thanks, let us know if you encounter any issues! Some of you might have stumbled upon me as I accept pull requests and orchestrate the translation effort. We told you to wait with translating diagnoses/symptoms, because they haven't been proof read. I am the one doing this work, however I have an exam tomorrow (the 12th of October) and therefore I haven't been able to put much effort into it yet. This post is to give you an update and to tell you that I will pick up on proof reading the diagnoses and these will be finished some time next week. Thank you for your patience and good work so far. Hi, a quick update: in the latest version of the build on Steam some languages where we encountered issues with readability (Japanese and to be sure also Chinese and Korean) don't use bold font style anymore, which was hopefully the cause of the problem. Let us know if it helped! Hi, there's a new build available on Steam and I'm about to upload another update of the English texts. The changes are mostly related to the title screen/main menu, so the UI file has the most changes. And as we're really close to the complete version, this should be the last relatively big update. So LEVEL_SANDBOX_HOSPITAL_D and LEVEL_SANDBOX_HOSPITAL_F are the same? I see typo in the base text by the way: All departmens! <= should be All departments! Also aren't UI_ACHIEVEMENTS and EXIT_TO_DESKTOP not missing from the UI file? PuckStar wrote: So LEVEL_SANDBOX_HOSPITAL_D and LEVEL_SANDBOX_HOSPITAL_F are the same? Yes, the sandbox levels have the same name and description, typo has been already fixed. Once again thanks everybody, almost there! With the risk of sounding like an imbecile... I have no idea what to do about all these updates. I mean I figured out that I add the new ones at the end of the documents they belong in, before the closing tags, but the updated texts? What am I to do about those? I THINK I added all new translations to the UI one, but still the main menu items has "!LOC" on them and I can't seem to even find the texts for them in the UI document. Galanthus wrote: With the risk of sounding like an imbecile... I have no idea what to do about all these updates. I mean I figured out that I add the new ones at the end of the documents they belong in, before the closing tags, but the updated texts? What am I to do about those? Hope this helps. let us know if you have any more issues! Hi all, here's a breakdown of the last changes in the texts, mostly minor fixes, one new notification and an update of the radiology objects. The following ones changed from prefabs to composite objects, which allows to move all this big machines! Feel free to copy the descriptions from the prefab lines. Hi, we've got a few small changes in texts that we'd like to include in a patch next week (we won't include the related features in tomorrow's patch yet to give everybody time to have a look at these first). 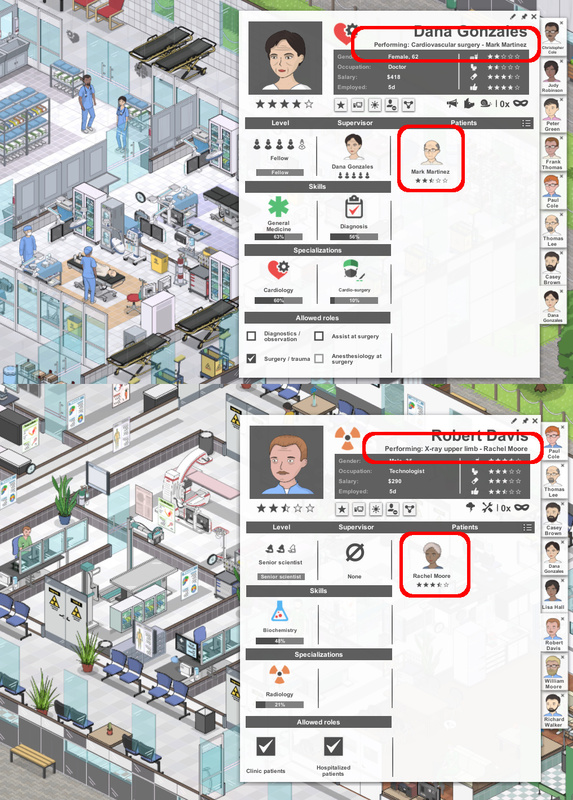 The main feature should be really useful, see screenshots below - employees will show which character they're either reserved by or performing a procedure on. Should be a pretty useful bit of information especially if somebody looks stuck and is just waiting for a free nurse to bring their patient - or similar cases. The files are on github already.